Worthing Raiders were sent crashing to a first defeat in three National League 2 South matches this afternoon. 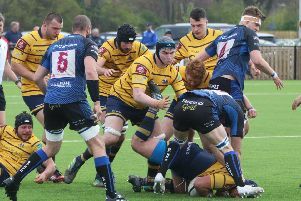 A hat-trick of tries from both Alan Awcock and Tom Hall, plus a Sam Portland effort helped Henley Hawks to a bonus-point 47-24 success at Roundstone Lane. Going into the game on the back of two straight league wins, Raiders succumbed to an early Henley onslaught as they ran in four tries in the opening 25 minutes on their way to victory. Finlay Coxon-Smith went over six minutes from time to ensure Worthing bagged a losing bonus-point, which could prove crucial in their quest for safety. Despite the defeat Raiders remain 12th in the table, five-points and two places above third-bottom London Irish Wild Geese in the final relegation spot. Worthing were blown away following a rampant opening 25-minute spell from old rivals Henley. Hall went over for his first try of the day after ten minutes, before bagging a second less than five minutes later as Hawks raced into a 12-0 lead. Awcock and Portland both followed suit before 25 minutes were up to ensure Henley had a bonus-point in the bag prior to the half-hour mark. Raiders did address the slide in the latter stages of the half, with Jon Whittall's converted try a before the break their first points of the afternoon. Any hopes of a Worthing revival were quashed three minutes after the restart as Awcock went over for his second try of the match. Joe Watson-Brooks showed great tenacity to force his way over after 50 minutes to leave Raiders 33-14 behind. Each time Worthing seemed to have some hope, Henley replied to keep a considerable gap. This time around, Hall completed his hat-trick five minutes after Watson-Brooks' effort to help his side open up a 26-point leading margin. A bad afternoon for the home side worsened on the hour with replacement Pete Cleveland shown a yellow and sent to the sin-bin. Hawks made the most of the man advantage with Awcock bagging his third try less than a minute later to leave Raiders trailing 47-19. Worthing stuck to their task and went onto to bag a losing bonus-point following two tries in the final 25 minutes. First, Watson-Brook went over for his second of the day on 65 minutes, then Coxon-Smith surged over in the corner six minutes from time as it ended 47-24. Raiders travel to fifth-placed Redruth in the league next Saturday. RAIDERS: Storer; Watson-Brooks, Adams, Lamb, Lake, Whittall, Hewick, Perkins; Leeming, McLean, Irving, Loosmore, Richards, Coxon-Smith, Forrest. Replacements: Grief, Finney, Cleveland, Boyland, Dobson.